Runs for Cookies: How much effort is it worth? 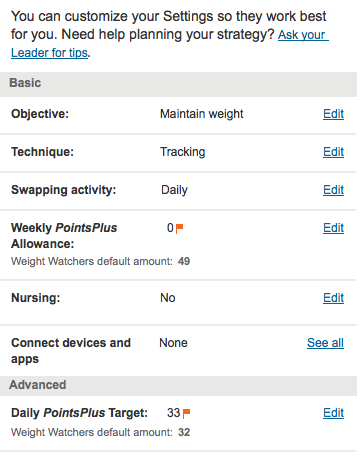 When you sign into your account, and then go to your food tracker, you click on "Settings" in the top right corner. I changed the objective to "Maintain weight" rather than "lose weight" (even though that's not my real objective, it will allow you to change the Daily PP Target at bottom). Technique is "Tracking". Swapping activity should be "Daily", so it won't hold onto your activity points all week. I set the Weekly PP Allowance to 0 (zero). And because I changed that to zero, I simply added 7 PP to my Daily PP Target, making it 33 (usually, it's 26 when my objective is to lose weight; so if your daily PP target is now 30, then you would just add 7, and your new one would be 37). By doing the settings this way, every single day starts out the same: 33 Daily PP, 0 Weekly, and 0 Activity. If you exercise, you can earn more. You're still getting the same number of Points either way, but this way every day is the same; you don't have to track anything for the week. Hope that makes sense! I have no idea how well this will work, but I'm going to give it a try for a while. I can definitely see how this could be what's keeping me from putting in the extra effort to get back to goal. I'm certainly "okay" with how I look right now--when I saw my pics from Portland, I never thought, "Eww, I need to delete that!" or anything. I certainly think I looked better when I was at goal, but I don't think I look bad now. I desire to get back to goal, because I was faster at running, and my clothes fit well, and I just looked better; but maybe, subconsciously, I am not putting in the extra effort toward being strict with counting because I'm okay with how I am now. When I was 253 pounds, or even 200 pounds, I hated how I looked, I felt terrible, and I was unhealthy. Now, I feel healthy; I look okay in a size 8; and I feel like a "normal" person. So, the desire to lose weight when I was 253 pounds was MUCH greater than it is now, which is probably why it was easier for me to stay consistent. At 253, the reward in my future (for making the effort to lose weight) was monumental; whereas now, the reward is just a slightly smaller clothing size and a little less pudge. So basically, it's not that I don't care if I lose this weight to get back to goal; it's just that I don't care as much as I did when I had over 100 pounds to lose. Thank you to whoever left that comment! I'm not sure if it'll help me moving forward, but it certainly gives me a lot to think about and makes me feel less frustrated about staying on track. I guess I just have to determine what I want more--to be "okay" with how I am now, putting in little effort? Or to be very happy by being at goal, and putting in a heck of a lot of effort? I'll have to give it some serious thought. Interesting! Ohmygoodness, I started a new puzzle today, and at the same time, started binge-watching Marriage at First Sight on A&E. It's a show about three couples who agreed to get legally married into an arranged relationship with someone that they'd never met and knew absolutely nothing about. They didn't even know each others names until the wedding! When I heard of the show, I thought it was sort of insulting to marriage ("Well, if it doesn't work out, we'll just get divorced! No harm done! "), which is why I didn't watch it. I really liked that post and comment. I think it speaks to a lot of us that are going back and forth with five or ten pounds and even to those with the last ten to fifteen to lose. I'm just not putting the effort in because I'm ok with where I am. However, I'm technically 15 lbs overweight and still have loose skin and flabby areas. Hmmmmm. Thanks for the continued honesty. Look out Spring, here I come! I totally agree with this Anonymous person. Before today, I just didnt understand why you were still counting points and being obsessed abou it. I just didnt get it! But now it unfolded.... To my eyes you look perfect! Like he/she said, healthy and happy (you hair is soo long, that's a sign -also- that you are healthy). Plus... Hey at this point (maintenance) we run to lose weight, we dont lose weight to run 'faster'. The speed comes with the practice and the pounds are left as CO2 outside. Like you and Jerry, my Du and I married way too young--I was 19 and he turned 18 just a week before the wedding. But he helped me grow up--He was always the mature one. I love him more today than I did on our wedding day almost 45 years ago. Sometimes it just works. I am so impressed with your story!!! You are giving me total motivation! What Anonymous wrote totally resonates with me! I am in my 'comfort zone' in a 5-15 pound range and so am constantly gaining and losing those numbers. However, I feel better at the low end for the reasons you stated so I have an 'ideal' that my body/mind doesn't seem to want to stay at (at least right now). Such an interesting journey and so helpful to have you and your readers insight and support along the way! Regarding the difficulty with getting back down to maintenance - I've always heard about how maintaining is way harder than losing. I've been reading Tina Jane's sparkpeople blog (featured on your last motivation monday) and she is very involved in maintenance teams there. She has mentioned a few times about how when you are losing you are reaching goal after goal, starting new things, fitting in smaller clothes and getting compliments left and right, BUT after maintaining for a while all of that fizzles off. People are used to your size, you aren't fitting into smaller clothing sizes, etc. I thought it was interesting to see that perspective and to have a heads up for what will hopefully come my way eventually. One thing I think is great about YOUR journey, Katie is that you have always continued to set new goals with your fitness, so you weren't so reliant on those other types of perks from weightloss. Anyway, just a thought. I am trying this technique now. I am also going through this cycle of starting my week out tracking, then things fall apart, and then I just wait for the new week again! I'm been gaining and losing the same 5 pounds of the 10 I need to get back to my goal weight. It's been frustrating, but I'm all for trying new ideas, so thank you!